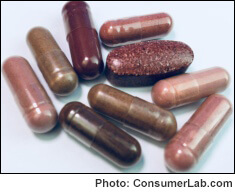 Make sure the red yeast rice supplement you use provides what you need and is not contaminated! Clinical studies show that red yeast rice products can dramatically lower LDL ("bad") cholesterol. But our tests reveal that the concentration of cholesterol-lowering compounds in some products can be as much as 15 times that of others and, factoring in differences in suggested daily serving sizes, the amount you get per day can vary by nearly 30 times! In fact, we found that the suggested daily servings of only two products provided the amount of lovastatin compounds shown to lower cholesterol levels. It's questionable whether other products — which is most of them — would have a clinically significant effect. Four of the red yeast rice products we purchased for this review are the same ones tested in our last review but, as we discovered, now contain as much as 81% less lovastatin (a natural cholesterol-lowerer) than versions purchased in 2014. This suggests that they may be less potent than before. Red yeast rice supplements don't list their amounts of lovastatin, so there's no way for you to know what's really in these supplements. ConsumerLab.com tested them, providing you with invaluable, head-to-head comparisons. This is a must-see report for anyone using or interested in red yeast rice. Results of an earlier report on red yeast rice by ConsumerLab.com were deemed so important to the medical community that they were published in the prestigious Annals of Internal Medicine. Our latest red yeast rice results may be even more important! You must be a member to get the full test results for nine red yeast rice supplements along with ConsumerLab.com's recommendations.